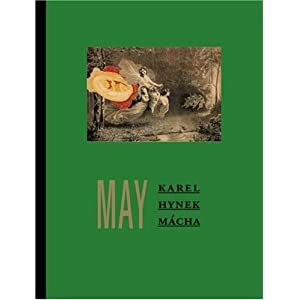 I've just finished reading May by Karel Hynek Mácha, a long narrative poem translated from the Czech by Marcela Sulak and published in a beautiful edition by Twisted Spoon Press. This book is so attractive a physical object, in fact, that you will spend at least as much time gazing at and fondling it as you will reading the text. Be careful, however, not to drool, as this may be injurious both to your social standing and the fabric of the book. As the very useful introduction explains, the poem, first published in 1836, marked a watershed in Czech letters as it ruptured the absolutism of patriotism and nationalism as dominant themes, and embraced many of the Romantic ideas, themes and techniques which had already pervaded other European literatures and cultures. May also broke new metrical ground, and saw the author introducing the iamb into his country. I can picture the scene now, as Mácha pads around the quieter districts of Prague and the outlying countryside, stealthily crouching to open the door of a small but comfortable cage to usher out another flock of iambs into the wild. Da DUM da DUM da DUM da DUM resound their tiny feet as they scatter abroad, giddy with the excitement of freedom and relishing the prospect of befriending the native dactyls. Anyhoo - the poem remains massively popular in its native land, with new editions disappearing rapidly from bookshops and schoolchildren being able to recite - presumably before they can be restrained - huge chunks of it verbatim. Learning this made me feel somewhat bereft of a poem with similar status in the home life of our own dear nation; I'm not sure Morte D'Arthur quite passes muster in this capacity, and there doesn't seem to be the same unselfconscious interest in and embracing of poetry nationally and across all classes as there would seem to exist in Slovavakia and (in my experience, for example,) Wales. Discuss. "Then I will breathe a pleasant fragrance." "I'll sprinkle on the coffin rain." "I'll make the wreaths for it." "We will take them to the coffin." "Little candles we will bring." "I will awake the hollow bells." was evening May - the time for love. to where the pine grove's fragrance lay. the flowering tree belied love's woe. I've enjoyed everything I've read from Twisted Spoon, a publisher as interesting as it sounds, and recommend that you buy their entire list as Christmas presents for your legions of pals. What date was this poem written?